Special Ops Command seeks to “Operationalize” the homeland; “…informationally aware, smartphone‐enabled urban populations and their satisfaction—or lack of satisfaction—with local, regional, and even global conditions…” presents challenge to military. Is Jade Helm part of the plan to “Operationalize the CONUS base”? One of the largest military exercises to ever be conducted on United States soil is set to begin this July. Titled “Jade Helm” the exercise seeks to “Master the human domain”. Infowars.com has documented the significance of the “Master the human domain” motto of Jade Helm. The military is seeking to gain a full spectrum picture of the everyday lives of their adversaries. This information is used to create threat matrix data on key populations. Lt. General Charles Cleveland, the Commander of Special Operations, is directing the exercise. Operations Planner and retired Green Beret Thomas Mead confirmed this fact during a Q&A at the Brazos County Commissioners Court in Texas. 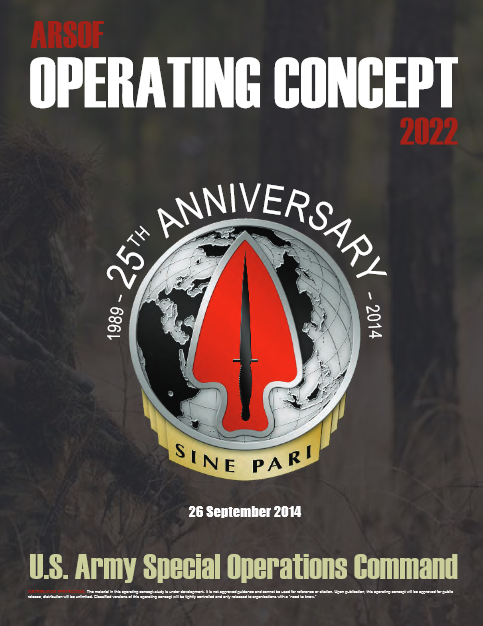 General Cleveland penned a strategy document in September of 2014 titled “ARSOF Operating Concept 2022“. The strategy outlined in the document seeks to establish a world-wide network of military influence to gather intelligence on key populations and contain non-state actors, “empowered individuals”, militias, and other “irregular” threats. The document emphasizes the global nature of the threat, noting that the conflict will effectively erase borders. In order to counter threats from these groups, Special Operations will utilize various technologies including; Electronic warfare, directed energy, space, robotics, Unmanned vehicles, and low-visibility stealth technologies. Perhaps the most sensational portion of the document comes from the statement that Special Operations wants to “Operationalize the CONUS base“, meaning Continental United States. General Cleveland’s strategy is to utilize civilian assets to support deployed soldiers. The plan seeks to utilize non-governmental agencies, think tanks, academia, and other U.S. government agencies to support Special Operations goal of containing the threat of VEO’s (Violent Extremist Organizations), non-state actors, and other irregular threats. This aspect of the Special Operations plan as it relates to the Jade Helm exercise raises highly concerning questions. The fact that conservative areas of the United States are listed as “Hostile” in the Jade Helm map should be concerning to citizens. General Cleveland’s strategy is clearly global in nature, and clearly states that the conflict has effectively erased borders, leaving the option of domestic operations on the table. The language of the 2022 document is very similar to an Atlantic Council article published last year which warned of the decline of the “New world order” as non-state actors and empowered individuals threaten to destabilize the globe. The Atlantic Council is a Washington D.C. based think tank that has ties to highly influential policy makers. The 2014 piece, written by “shock and awe” doctrine author Harlan K. Ullman, laments the fact that George H.W. Bush’s dream of a “new world order” is failing. Ullman says that the State is being “…made obsolete by the empowerment of individuals and non-state actors.” Ullman states that an “extraordinary crisis” is needed to counteract this trend.